Stock photo of statue/monument to King Maximilian 1st of Bavaria in Max-Joseph-Platz outside the Nationaltheater Mnchen (National Theatre Munich), City of Mnchen (Munich), Bavaria, Germany, Europe. Statue of King Maximilian 1st of Bavaria in Max-Joseph-Platz outside the Nationaltheater Mnchen. 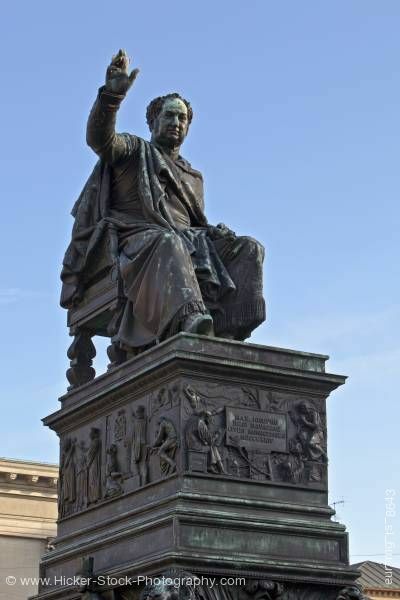 This stock photo shows the details of the Statue/monument to King Maximilian 1st of Bavaria in Max-Joseph-Platz outside the Nationaltheater Mnchen (National Theatre Munich), City of Mnchen (Munich), Bavaria, Germany, Europe. A bronze statue of the King Maximilian 1st of Bavaria sits in front of the National Theatre of Munich. Sitting on a chair, King Maximilian 1st is dressed in robes with his right hand raised just above his head. The bronze statue show signs of patina where the bronze is turning green due to exposure from the elements. Decorative carvings surround the bronze base of the monument. A plaque sits in the center of the base. Statue/monument to King Maximilian 1st of Bavaria in Max-Joseph-Platz outside the Nationaltheater Mnchen (National Theatre Munich), City of Mnchen (Munich), Bavaria, Germany, Europe.